If you live in an older home, you are likely to have a small bathroom that is just big enough for a shower/tub, sink, and toilet. Although you could bust out walls to make the bathroom larger, there are some remodeling tips to help make your small bathroom feel larger without the cost of a major renovation. Here are eight tips to consider. The best thing to do is stay with one light color. Good colors to consider include soft gray, butter yellow, warm white, icy blue, and seafoam green. White is the best color for cabinetry and trim. This light color palette will open up a small bathroom and make it feel bigger. Nonetheless, bathrooms do not have to have no color. Add color with accessories such as towels, soap dispensers, and rugs. Think about adding both color, pattern, and texture. The best thing about adding color this way is that you can update your bathroom later simply by changing a few accessories. 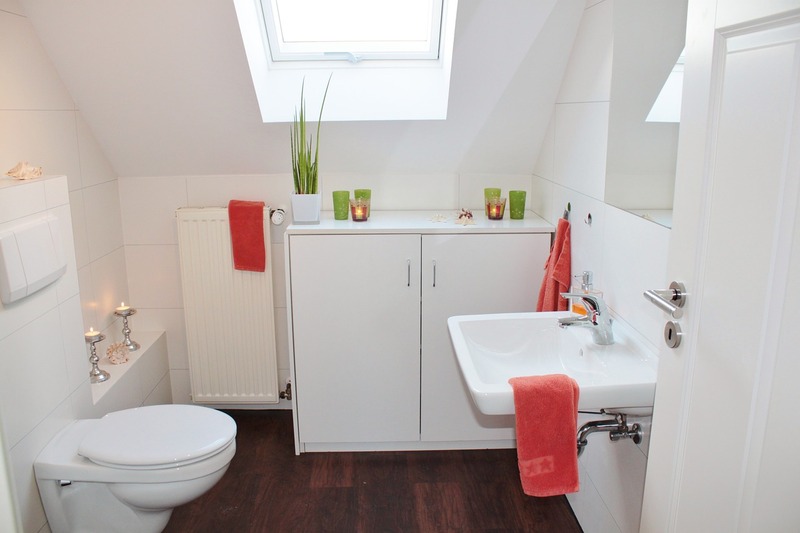 Since doors swing inward, your small bathroom will have less usable space. However, a pocket door eliminates the need to save space for the door. You can also consider a frosted glass pocket door that will make the room feel even larger. If you have a small bathroom, limit what you store there. Instead of storing everything you ever need in a bathroom, store only the essentials. Then, move things like extra towels, spare toilet paper, and cleaning supplies to a nearby hall closet. You should also create customized storage in the vanity. Be sure that you have a space for your need toiletries and make-up essentials. By changing your shower door to clear glass, the room feels larger because it now includes the shower space. You might also consider changing your tub/shower combo to a standing shower. This will also make your bathroom feel larger and will give you more room for showering. Adding ventilation will make a room feel bigger during use. Small bathrooms feel steamy faster than larger bathrooms. With the right ventilation, you can eliminate the high humidity that makes you feel claustrophobic as well as damage your walls. The best ventilation fans for small spaces are recessed so that your space looks uncluttered. For more bathroom remodeling tips, give us a call. We’d love to help you find ways to enhance your home before you list it for sale.